As a pregnant lady and mother of a 14 month old I get these crazy cravings and also very little time to fulfill them! 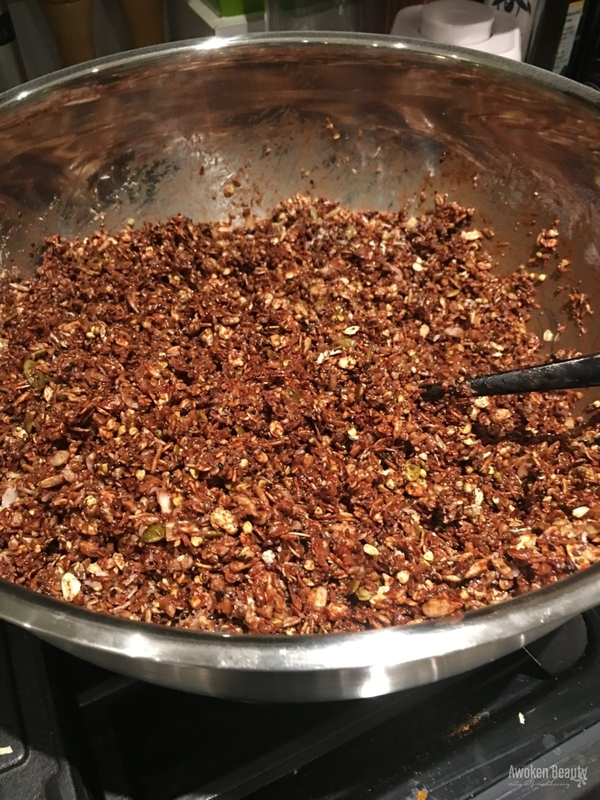 Also when you have a small child who has no patience because food should be served the moment her night diaper is changed, this healthy, filling, yummy granola comes in. I took the original recipe from #mynewroots since she is so awesome. But as my tendency goes, I take a recipe and only use it as an inspiration to do so much more with it. I never really measure what I am doing but this time, surprisingly, I did! Also, every time I bake this kind of breakfast/ snack I make a very large quantity so it lasts at least a few weeks. 2 cups of rye flakes (same goes here. I like different cereals since they give you different kinds of nutrition and all the ones I used are good carbs). 2 cups of unsweetened coconut flakes (I used two kinds of coconut since I find it delicious, it has good fats and I like texture in my granola, so coconut helps). Mix all dry ingredients except nuts, seeds, cocoa and salt. Place all nuts in a food processor and pulse them up enough that they are small pieces but not so much that it turns into powder. Mix the nuts with the rest of the dry ingredients. (I usually add cinnamon because I love cinnamon, but this time i forgot! feel free to add as much as you’d like). In a small pan place the coconut oil, maple syrup, tahini paste and vanilla. Make sure everything is melted. Taste to see if you like how sweet it is, if you have a sweet tooth, add some more maple. Add the salt and mix it up. If you are a chocolate fiend like me and want to eat chocolate in a healthy way, this is where the raw cocoa comes in, add it to the liquid you have. If you do not like/ crave/ want chocolate, you can skip this step. Fold in the wet ingredients into the dry and make sure everything is coated. Make sure the granola is thick and flat. You can use a spatula to flatten and tighten it. Place the trays in the oven for 15-20 minutes. It depends on your oven. Mine is kind of slow on the baking, except in a corner where it likes to burn things up! After the 15-20 minutes take the trays out and if your granola is in chunks just turn it over, if it isn’t, just mix it up a bit with a spoon. Most recipes now will tell you to place the trays back in and mix the granola every 2-4 minutes, but who has the time, headspace or attention to actually stand by the oven to do it? My way of not burning things down is to lower the temperature to 300 and place the trays back in for 10-12 minutes (again, depending on your oven’s mood). Once you take the trays out wait until it cools down to place into air tight containers. I like mine with milk or kefir, or yoghurt! My 14 month old loves this granola too, it is so filling, has very good fats and carbs and it does for a great grab and go breakfast.